The Eldridge Street Synagogue, built in 1887, is a National Historic Landmark synagogue in Manhattan's Chinatown neighborhood. The Eldridge Street Synagogue is one of the first synagogues erected in the United States by Eastern European Jews (Ashkenazis). One of the founders was Rabbi Eliahu the Blessed (Borok), formerly the Head Rabbi of St. Petersburg, Russia. It opened at 12 Eldridge Street in New York's Lower East Side in 1887 serving Congregation Kahal Adath Jeshurun. The building was designed by the architects Peter and Francis William Herter, (but unrelated to the Herter Brothers cabinet-makers). The brothers subsequently received many commissions in the Lower East Side and incorporated elements from the synagogue, such as the stars of David, in their buildings, mainly tenements. When completed, the synagogue was reviewed in the local press. Writers marveled at the imposing Moorish Revival building, with its 70-foot-high vaulted ceiling, magnificent stained-glass rose windows, elaborate brass fixtures and hand-stenciled walls. Thousands participated in religious services in the building's heyday, from its opening through the 1920s. On High Holidays, police were stationed in the street to control the crowds. Rabbis of the congregation included the famed Rabbi Abraham Aharon Yudelovich, author of many works of Torah scholarship. Throughout these decades the Synagogue functioned not only as a house of worship but as an agency for acculturation, a place to welcome new Americans. Before the settlement houses were established and long afterward, poor people could come to be fed, secure a loan, learn about job and housing opportunities, and make arrangements to care for the sick and the dying. The Synagogue was, in this sense, a mutual aid society. For fifty years, the Eldridge Street Synagogue flourished. Then membership began to dwindle as members moved to other areas, immigration quotas limited the number of new arrivals, and the Great Depression affected the congregants' fortunes. The exquisite main sanctuary was used less and less from the 1930s on. By the 1950s, with the rain leaking in and inner stairs unsound, the congregants cordoned off the sanctuary. Without the resources needed to heat and maintain the sanctuary, they chose to worship downstairs in the more intimate house of study (Beth Midrash). The main sanctuary remained empty for twenty-five years, from approximately 1955 to 1980. 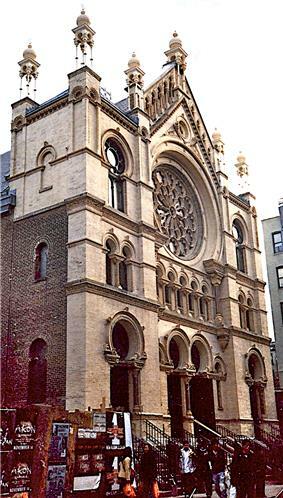 In 1986 the non-sectarian, not-for-profit Eldridge Street Project was founded to restore the synagogue and renew it with educational and cultural programs. Paul P. E. Bookson, a former State Senator and Civil Court Justice, was instrumental in maintaining the Orthodox Religious services at the Eldridge Street Synagogue and its building restoration. On December 2, 2007, after 20 years of renovation work that cost US$20 million, the Eldridge Street Project completed the restoration and opened to the public as the Museum at Eldridge Street, reflecting its cultural and educational mission, within the Eldridge Street Synagogue building. The museum offers informative tours that relate to American Jewish history, the history of the Lower East Side and immigration. Occasionally, Jewish religious events are celebrated there, though not in the former main sanctuary. The effort to return the sanctuary to its Victorian splendor, while maintaining the idiosyncrasies of the original aesthetic and preserving patina of age, included plaster consolidation and replication of ornamental plaster elements, over-paint removal, conservation, in-painting replication of stenciling, wood finishing and decorative painting including: faux-woodgraining, marbleizing, and gilding by skilled craftsmen. The Orthodox Congregation Kahal Adath Jeshurun continues to meet for evening services in the Beth Midrash and daytime services in the main sanctuary; Kahal Adath Jeshurun has never missed a Saturday or holiday service since the synagogue first opened. The Eldridge Street Synagogue was designated a National Historic Landmark in 1996. ^ a b "Eldridge Street Synagogue". National Historic Landmark summary listing. National Park Service. September 11, 2007. ^ a b c Newman, Renee; Schlanger, Maria; Waterman, Amy E. (1983). "National Historic Landmark Nomination: Eldridge Street Synagogue" (pdf). National Park Service. ^ Rothstein, Edward (December 1, 2007). "Return of a Long-Dormant Island of Grace". ^ Cole, Diane, "Joy on Eldridge Street", Preservation Magazine Volume 60, Number 2, March / April 2008, p. 56. ^ "History". Museum at Eldridge Street. Retrieved March 15, 2015.